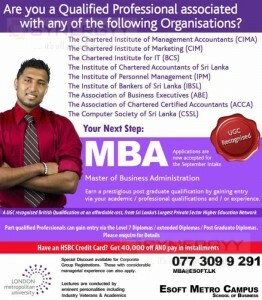 Are you a Qualified Professional associated with any of the following Organisations? Here is an offer from the Esoft Metro Campus for you to obtain a Master of Business Administration from Qualified Professional. Earn a prestigious post graduate qualification by gaining entry via your academic / professional qualifications and / or experience. Part qualified Professionals can gain entry via the Level 7 Diplomas / extended Diplomas / Post Graduate Diplomas.